A part of normal cat behavior is their instinctive need to scratch on surfaces to remove excess claw material and keep the nails clean and in good shape. Cats obviously enjoy this behavior and certainly are not aware that their behavior may be seen as destructive to their owners. Unfortunately, while your cat is happily clawing on your favorite chenille chair, you may be grimacing and very unhappy with one of your favorite family members. Soft Claws: These are vinyl nail caps for cat claws that are applied with surgical adhesive, and to which cats usually get used to within a few days. This requires a patient and dedicated owner but it is a reasonable alternative to declawing. These usually stay in place for 4-6 weeks. Toys/Scratching Post: This might be a foregone conclusion in the eyes of some cat owners, but it is very important to have sufficient options for feline recreation. Some cats are very particular, so make sure the equipment you invest in has your feline friend's seal of approval. 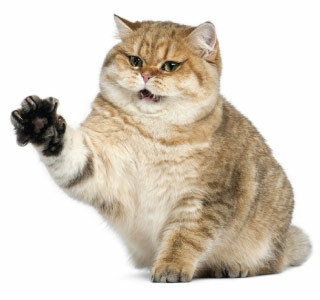 Synthetic pheromone sprays/diffusers: Consider using synthetic pheromone sprays and/or diffusers to help relieve anxiety or stress, which may or may not be related to your cat's scratching behavior. Apply a synthetic pheromone spray on the objects or areas in your home where your cat has exhibited undesired scratching. Declawing kittens or adult cats requires the removal of the claw. Because the claw is permanently affixed to a cat's knuckle, this also means removing all or part of the third bone from a cat's paw. There are two common techniques in declawing cats, Blade Declawing and Laser Declawing. At Metairie Small Animal Hospital we only perform the Laser Declawing procedure. Numerous studies that have researched a potential correlation between cat declawing and personality changes strongly indicate that none exists. Please remember that it may take your cat a little time to feel comfortable walking on surgically sensitive paws, which could indeed affect his or her personality traits and behaviors during the recovery period. Therefore, it is always important to be nurturing and supportive during the recovery process, in order to help facilitate a speedy recovery. However, we find that most cats recover very quickly after a Laser Declaw procedure and most don't show any signs of discomfort. At Metairie Small Animal Hospital, our veterinary team has provided education and insight to help many concerned and caring cat owners decide if declawing a cat is the right decision to make. If you are looking into cat declawing surgery, or have any questions about declawing cats, please contact us to schedule an appointment with a member of our veterinary team today.